Nicklas Backstrom scored 1:55 into overtime Friday to lift the Washington Capitals to a 4-3 victory and gave Bruce Boudreau (above) a win in his first game as head coach. Nicklas Backstrom celebrated his 20th birthday by giving his new coach a gift — his first NHL victory. The rookie center scored 1:55 into overtime Friday ( 700K) to give the Washington Capitals a 4-3 victory over the Philadelphia Flyers in Bruce Boudreau’s first game as coach. "I really don't know what happened," said Backstrom, who picked up a loose puck after Alexander Ovechkin carried it into the zone. "The puck came to me and I waited out (goaltender Martin Biron) and it worked." The Capitals came to Philadelphia having lost 15 of their previous 18 games following a 3-0-0 start — a slump that got coach Glen Hanlon fired on Thursday. 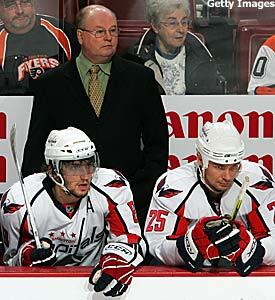 Boudreau was an NHL journeyman, playing 141 games in parts of eight seasons, but was a big scorer at the AHL level. As a coach, he won the 2006 Calder Cup title with the Hershey Bears, the Capitals' AHL affiliate, and got them to the league final last season. He said he wasn't really worried or thinking about his emotions before the game. "I was really thinking about the players and trying to make sure that they were positive about themselves," Boudreau said. "They were playing such a good game that there was no way something bad was going to happen in the end." Despite the win over Philadelphia, Washington still has the NHL’s worst record —7-14-1, for a league-low 15 points. Boudreau says the Caps have a lot of work to do, but that he doesn't expect to make major changes. Washington took an early lead when defenseman Mike Green one-timed Backstrom’s cross-ice pass behind Biron from the left circle for a power-play goal 2:27 into the game ( 700K ). Chris Clark made it 2-0 at 3:39 of the second period ( 700K ) when he tapped in Viktor Kozlov’s feed, and Donald Brashear’s tip-in of Shaone Morrison’s wrist shot at 14:11 put Washington ahead by three ( 700K ). "I don't know if it was from the turkey or whatever, but we just didn't come out like we wanted to today," Philadelphia's Scott Hartnell said. "After the first period (coach) Johnny (Stevens) was in here yelling at us, trying to get us going." But the Flyers then took control of the game. Daniel Briere stuffed a rebound past Olaf Kolzig ( 700K ) at 15:45 and Jeff Carter snapped a shot from the right circle into the net ( 700K at 17:49, cutting the margin to one goal. Mike Richards got the Flyers even with 15:45 to play, banging R.J. Umberger’s rebound past Kolzig ( 700K ). The Flyers had a chance to win the game in regulation, but were unable to capitalize on a late power play. Briere said it was difficult to a play against a team making its first appearance under a new coach. "Whenever you face a team playing for a new coach, their guys want to prove obviously that they can play," he said. "They want to show that they can do the job in certain situations. They all have a little extra jump in their legs and it showed in the first half of the game. Those guys were skating and playing hard." Tim Thomas continues to be one of the NHL’s best-kept secrets, though perhaps not for long. Thomas made 25 saves as Boston held off the Islanders at the TD Banknorth Garden. The Bruins have won four of their last five and are off to a surprising start despite scoring two goals or less in 12 of their 20 games. Luckily for Boston, they were playing a team that’s having its own offensive struggles. The Islanders haven’t scored more than two goals in any of their last seven games, though they’ve won three times. Their biggest problem is a power play that’s gone cold — the Isles missed their best chance early in the third period when they failed to get as much as a shot on goal during a 1:40 two-man advantage early in the third period with the Bruins holding a 1-0 lead on Glen Murray’s power-play goal late in the second period. Glen Metropolit made it 2-1 with 7:19 remaining in regulation time ( 700K ), beating Rick DiPietro through a screen from the left circle. Mike Sillinger gave the Islanders some hope when he scored with 5:39 to play ( 700K ), but the Isles fizzled again on a late power play. “We were stationary out there and the confidence isn’t there,” Isles coach Ted Nolan said. They’ll get a chance to try again against the Bruins on Saturday, when the Islanders host the back end of the home-and-home series. Pascal Leclaire made 32 saves for his club-record sixth shutout of the season in the Columbus Blue Jackets' 4-0 victory over the Minnesota Wild. Pascal Leclaire expected to have the day off. Instead, he wound up setting a Columbus record for shutouts in a season and getting the Blue Jackets back on track. Leclaire stopped 32 shots for his sixth shutout of the season as the Blue Jackets ended a five-game road losing streak and won for just the second time in seven games. “We just wanted to come in and play a solid game today," said Leclaire, who started because backup Fredrik Norrena was sick. "I'm honest. I know when I play good. I know when I don't. Today I had to focus on being calm and patient." Columbus held team meetings the last two days to address its recent slump. Center Michael Peca felt the players were not connecting with what the coaches were telling them. "Collectively, we weren't getting the message sent down from the coaching staff," he said. "We needed to re-evaluate where we are and where we're capable of being." Coach Ken Hitchcock said his team was finally rewarded for its efforts. Peca, coming off a groin injury that forced him to miss six games, opened the scoring with a power-play goal at 3:27 of the first period ( 700K ) and added an assist. David Vyborny ( 700K ), Dan Fritsche ( 700K ) and Rick Nash ( 700K ) also scored for Columbus, which took advantage of several turnovers by the Wild. Minnesota has its own problems. The Wild have lost 10 of their last 14. The Wild look little like the team that opened the season by going 7-0-1. "I'm trying to look at the overall picture," coach Jacques Lemaire said. "It goes like this, exactly what I told them after the second period: We are getting out of our game. The little things that make this team better, we're getting out of." The Honda Center crowd cheered Ilya Bryzgalov when he returned in a Phoenix Coyotes uniform a week after the Anaheim Ducks waived him. He returned the favor by stopping 23 shots in regulation and two more in a shootout as Phoenix won in Anaheim for the third time this season. During a first-period timeout, a video presentation honored Bryzgalov’s time with the Ducks; he acknowledged the raucous ovation from the sellout crowd with three waves of his glove hand. "When they showed they were thankful on the Jumbotron, I was crying a little bit because it was an unforgettable time in Anaheim with my former teammates," said Bryzgalov, a member of last spring’s Stanley Cup champs. "They were good guys, it was a great time — but now it is in the past." His present is with Phoenix, where he’s 3-0-0 and has allowed just four goals while stopping 79 of 83 shots. Phoenix’s Radim Vrbata sent the game into overtime by scoring a power-play goal with 1:07 remaining in regulation ( 700K ). With Bryzgalov on the bench in favor of an extra skater, Vrbata one-timed a pass by Daniel Carcillo past Jonas Hiller, who succeeded Bryzgalov as Jean-Sebastien Giguere’s backup. After a scoreless overtime, Shane Doan and Vrbata beat Hiller, while Bryzgalov stopped Ryan Getzlaf and Corey Perry. It was Bryzgalov’s first NHL shootout victory — he was 0-5 with Anaheim and allowed seven goals in 16 attempts. The Coyotes took an early lead when rookie Peter Mueller scored at 9:46 of the first period ( 700K ), but Anaheim pulled even when Getzlaf was credited with a goal after Phoenix defenseman Nick Boynton accidentally put the puck through his goaltender’s legs while trying to control it in front of the net ( 700K ). Vrbata put Anaheim back in front midway through the second period, beating Hiller with a snap shot ( 700K ), but Chris Pronger tied the game with 20 seconds left in the period ( 700K ), beating Bryzgalov with a slap shot after the goaltender had had his stick knocked out of his hands. Pronger put Anaheim ahead 2:50 into the third period ( 700K ), beating Bryzgalov with another slap shot after Travis Moen won a faceoff. But Pronger was penalized for slashing Doan at 18:13, leading to Vrbata’s tying goal. “We’ve got to play 60 minutes in this league to win a hockey game," Pronger said. "It’s more disappointing than anything. We’ve shown at times that we can play those 60-minute games and play to a high level." Added Ducks coach Randy Carlyle: "You have to make sure you play rock solid, and you can’t make those mental mistakes or those structured mistakes that are costing us. We were out of position and they score a 5-on-4 and that basically was the difference in the hockey game." Eric Staal netted his 100th NHL goal in the Carolina Hurricanes' 4-3 victory over the Tampa Bay Lightning. Tampa Bay was 20 minutes way from a third straight dominant victory over Carolina before the Hurricanes’ third-period rally gave the ’Canes a stunning victory at the RBC Center. Glen Wesley capped a three-goal rally in less than seven minutes by beating goaltender Johan Holmqvist with a wrist shot at 8:39. It was his first goal since an overtime tally against Philadelphia on Feb. 22. Tampa Bay outscored Carolina 11-2 in winning their first two meetings and led 3-1 after two periods as Vincent Lecavalier had a goal and an assist. The Lightning outshot the Hurricanes 20-10 through 40 minutes. “We got what we wanted for 40 minutes," Lecavalier said. But Ray Whitney took a pass from Matt Cullen and lifted a shot through defenseman Brad Lukowich that sailed over goaltender Johan Holmqvist's right shoulder at 1:56. At 6:01, Jason Williams skated in on a 3-on-2 and shot from between the circles, again going high to beat Holmqvist on his blocker side for the tying goal. Staal then did the work to set up Wesley’s goal. The turnaround left the Lightning trying to figure out what happened. "We play really good for part of the game," Lecavalier said. "As soon as we make a mistake, it ends up in our net. It's a bad loss for us. There's no excuses." Staal’s 100th NHL goal put Carolina ahead, but Tampa Bay dominated the next 35 minutes. Paul Ranger scored at 14:53 ( 700K ) to tie it, and Lecavalier assisted on Vaclav Prospal’s goal at 12:08 before whipping a backhander past Cam Ward at 14:27. Martin Brodeur cooled off the NHL’s hottest team, stopping 22 shots for his 93rd career shutout and disappointing a sellout crowd at Philips Arena. Atlanta came into the game with four straight wins and an 11-4-0 record since GM Don Waddell fired coach Bob Hartley and went behind the bench. But the Devils were at their ice-clogging best against the Thrashers, ending Ilya Kovalchuk’s four-game goal-scoring streak and Marian Hossa’s string of six straight multipoint games while winning their third in a row. "We didn't have our best game, and they played typical Devils hockey,” said Atlanta captain Bobby Holik, a former Devil. They play very patiently, wait for us to turn the puck over, and rely on Marty (Brodeur)." The Devils and new coach Brent Sutter have been playing “getting to know you” through the first quarter of the season, and the results haven’t always been pretty. But Brodeur says his first shutout of the season shows that the team and its new coach are now pretty much on the same page, especially with the recent return of forward Jamie Langenbrunner and defenseman Colin White. 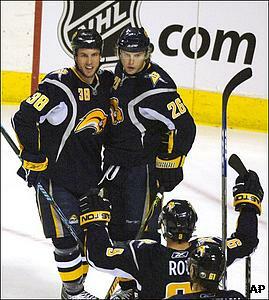 Langenbrunner, who missed the first six weeks of the season after sports hernia surgery, set up all three goals. Rod Pelley broke a scoreless tie 8:59 into the second period when his shot from the corner found its way into the net. Defenseman Paul Martin, back after missing three games with a hip injury, scored a power-play goal at 16:24 of the second. Jay Pandolfo hit the empty net with 28 seconds to play. “We did a lot of good things with and without the puck,” Sutter said. “We had a very solid effort throughout after getting our legs in the first period. We have a team-first mentality and we have to do things correctly within the structure of our system. Brodeur’s best stop was a brilliant, diving kick save of a shot by Pascal Dupuis from in close with nine minutes remaining. “When your goaltender is making saves like that it inspires your team,” Sutter said. Thomas Vanek's first goal in eight games helped lead the Buffalo Sabres to a 4-2 win over the Montreal Canadiens on Friday night. Buffalo is getting well with a big assist from Montreal, which lost at the HSBC Arena for the second straight Friday night. Last Friday, the Sabres took an early three-goal lead and held on. This time, they wasted a two-goal lead but went ahead to stay with 8:33 on Thomas Vanek’s goal. Vanek’s redirection attempt was stopped by goalie Carey Price, but he picked up the rebound in the slot and scored for the first time in eight games to give Buffalo a 3-2 lead. Daniel Paille added an empty-net goal with 14 seconds as Buffalo won its third in a row, though they’re still next-to-last in the Eastern Conference heading into Saturday’s rematch in Montreal. The Sabres took a 2-0 lead on Derek Roy’s redirection of Maxim Afinogenov’s shot during a power play 8:56 into the game and Connolly’s rebound goal at 7:39 of the second — his first goal in 12 games. But Montreal got one goal back midway through the period when Christopher Higgins’ shot from the high slot beat Ryan Miller, and tied it 4:56 into the third period when Tomas Plekanec finished off a breakaway by beating Miller with a forehand shot. Miller started for the eighth straight game; he’s allowed two goals or less in six of them. Price finished with 28 saves, and had his personal three-game winning streak stopped. The rookie netminder lost for just the second time in regulation in eight starts. Toronto’s first visit to Dallas in four years wasn’t a happy one for the Leafs, who got off to a fast start but couldn’t keep up with the reinvigorated Stars. Dallas improved to 4-0-1 since last week’s management shakeup that cost GM Doug Armstrong his job. Antti Miettinen scored the tiebreaking goal late in the second period and Marty Turco made 18 saves as the Stars won their fourth in a row. Toronto, playing at Dallas for the first time since Oct. 22, 2003, grabbed the lead 3:05 into the game when Alex Ponikarovsky converted Mats Sundin’s passout from behind the net. But scoring chances were few and far between after that for the Leafs, now 1-3-2 in their last six games. Mike Ribeiro tied the game 3:11 into the second period when he came out of the corner to the left of Vesa Toskala and beat him with a bad-angled shot. Ribeiro, a Montreal native, enjoyed beating his home city’s biggest rival. Toronto defensemen Kaberle and Andy Wozniewski were both near the puck before Miettinen took possession and broke between them, went in alone and beat Toskala at 15:31. Jeff Halpern hit the empty net with 40 seconds remaining. St. Louis goaltender Hannu Toivonen stopped 25 shots and the Blues won for the fifth time in six games with a 3-1 victory over the Vancouver Canucks. St. Louis finally gave its fans a chance to breathe a little easier, winning a home game by more than one goal for the first time in a month. The Blues have won four in a row at Scottrade Center, but this win was their first by more than a goal since a 4-2 victory over Anaheim on Oct. 23. Paul Kariya, rookie Erik Johnson and Martin Rucinsky had goals and backup goalie Hannu Toivonen made a case for more playing time with a solid 25-save performance as the Blues won for the fifth time in six games. The Canucks lost for the first time in regulation in the last nine games. They had gone 6-0-2 in their previous eight games. Ryan Kesler scored 5:11 into the third period to break up Toivonen's bid for his second career shutout. 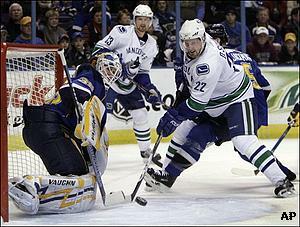 Kariya beat Roberto Luongo through a screen 17:46 into the game to put St. Louis ahead to stay. Johnson’s one-timer on a power play and Rucinsky’s tap-in of Mike Johnson’s pass made it 3-0 after two periods — too much for the Canucks to overcome.